I make a cake for our family friend every year for his birthday. This year, I decided to make a ding dong cake. I made a chocolate fudge cake with a creamy hazelnut filling. I made marshmallow fondant and marbled some of it with blue food coloring. I made chocolate ganache. Everything was going along good. Until I was ready to fill that cake. The filling did not set up. I had no more powdered sugar. It was too late to go to the store. So I found some unflavored gelatin and mixed it in. Voila! Pudding! After I got each of the layers filled I spread the chocolate ganache I had made between layers and over the whole cake…..almost. Oh, my! I was short some. Fifteen minutes later, it was sort of completely covered but it took the watchful eye of my twenty year old daughter telling me, “Mom, you missed a spot.” to get it done. 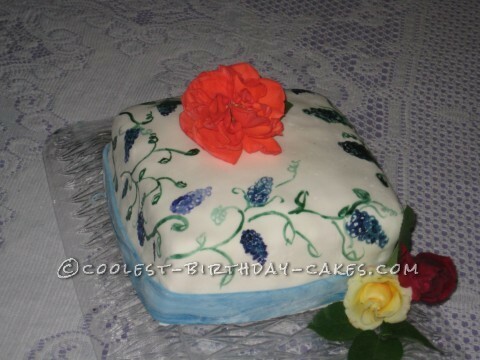 I rolled out the white fondant and covered that yummy cake. The next piece to go on was the blue marbled ribbon around the bottom. Then I went out to our rose bushes and got some pretty roses to adorn it with. But it needed something more. I got out my black food coloring and mixed some with a tiny bit of lemon juice and started painting. My daughter wanted to know why I was painting army green squiggles on that cake. I told her they were vines. Then I painted blue and purple “lilacs” and some nice leaves on. Everyone debated whether those were lilacs or grapes. Yeah. It was pretty tasty, too. The fondant had kept it perfectly moist.